Mindfulness is the practice of maintaining a non-judgmental state of heightened or complete awareness of one’s thoughts, emotions, or experiences on a moment-to-moment basis. This year Orange Bloom Yoga have teamed up with Yoga Aura to offer Mindful Yoga Retreats. 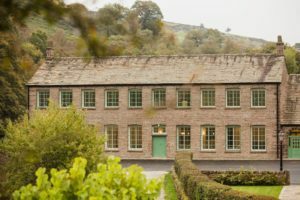 The retreats will take place at Gradbach Mill, Quarnford, located just outside Buxton the famous Spa Town, on the borders of Derbyshire and Staffordshire. Gradbach Mill set in a tiny hamlet is just 40 minutes’ drive from Manchester Airport. This is an exclusive weekend with places limited to a maximum of 26 guests. All rooms are equipped with luxury bathrooms, double, twin or king-size beds and Wi-Fi. There are 13 en-suite bedrooms, 3 x double en-suite (one on the ground floor with a wet room) 5 x en-suite twins 4 x Super king en-suite rooms and 1 x family – 4 single beds or 2 single and 1 x Super King-size en-suite. Saturday limited places for the day only – Ashtanga Vinyasa Flow, Pranayama, Meditation, Breakfast, Walk, Lunch and Restorative, Yin Yoga with Sound Healing – AVAILABLE FOR £65 Early bird/£70. Includes all vegetarian meals, juices and special dietary requirements. Treatments will also be available. A deposit of £100 pp is required. The rest can be paid in instalments to be settled 30 days prior to start date of the retreat. Cancellation fees will apply. This is the perfect venue and location to explore a variety of styles of yoga including Mindful Yin Yoga, Yoga Restorative Yoga, Ashtanga Vinyasa Flow Yoga, Pranayama and Yoga Nidra Meditation with a Restorative/Gentle Yin Healing Sound Bath Emersion. We will also explore the local countryside on foot although bikes can also be hired. A NATURAL WONDER SET IN THE HILLSIDE ABOVE GRADBACH AND BELIEVED TO BE THE INSPIRATION FOR THE MEDIEVAL POEM, SIR GAWAIN AND THE GREEN KNIGHT. Legend has it that Lud’s Church, a natural stone cleft sliced into the hillside above Gradbach, was the inspiration for Sir Gawain and the Green Knight – a medieval tale of chivalry, bravery and honour. Thought to have been formed by an ancient landslide, which saw a section of rock literally slip away from the hill, the deep chasm is 100 metres long and 15 metres deep.